You’ve been reading about your topic and planning your persuasive project on the topic. But you haven’t yet had to present that argument in a carefully planned, formal way. We’ve also discussed rhetoric from a variety of angles, always remembering that the roots of rhetoric are in oral communication, even though we haven’t formally practiced the verbal aspects of rhetoric. This small project, then, fills both of those gaps. That is, it gives you a chance to try out the persuasiveness of your final project, and it gives us all a chance to consider how verbal rhetoric compares and contrasts with the other modalities in which rhetorical communication can be practiced. As with your proposal, your challenge is to make a focused, clear, rehearsed argument even when there isn’t much time to do so. What will persuade your classmates in such a short amount of time? What blend of ethos, pathos, and logos will you use to persuade them? 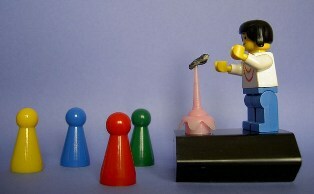 How will you organize your presentation? Give a three-to-five-minute presentation to the class that attempts to persuade your classmates to change their attitudes or actions on the topic of your final project. You may not use any visual aids. This is to encourage you to focus on your delivery (how you look and sound), your quality of ideas (how well you develop and support your argument for an audience of your classmates), and your organization (how you structure the order of your argument, including how you begin and end). You may use written notes, but you may not read multiple sentences in a row directly from your notes. In other words, even though your presentation will be carefully planned, it must be unscripted. This presentation counts as 5% of your final grade in the class. I’ll assess your presentation’s delivery, quality of ideas, and organization. Your final presentation grade will be the average of these three grades. Any presentations that last fewer than three minutes or more than five minutes will lose additional points. Presentations will given during the last week of class: on December 2, 4, and 6. To determine who will present on which day, I’ll get information from you in class on Friday, November 22, allowing you to say if you prefer going in the beginning, middle, or end. I’ll use that information to make an ordered list.